My Five has been bringing home some simple addition worksheets from kindergarten. I don’t do a lot of basic math work with her because it’s not her favorite. Shame on me. <:( To remedy that, I pulled out an addition game from my teaching days. First I made a list of words on her paper. I started simple and progressed to longer words. Since her little brothers are working on “I” and I hoped to have my Four be a part of this, the entire list began with that letter. As it turned out, my Four had no interest and instead began spelling words with the tiles. Now how could I stand in the way of this? The answer is that I couldn’t. 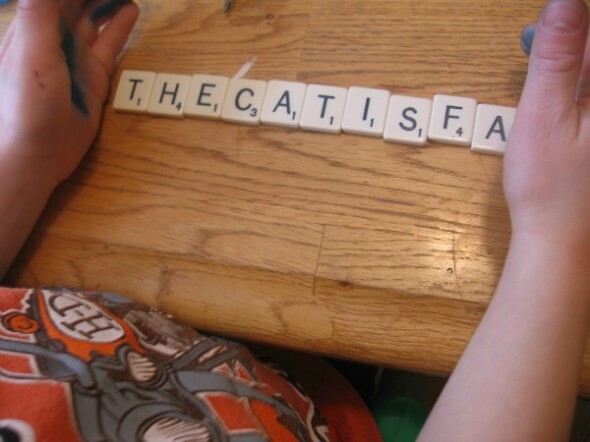 So while helping him with spelling (he wanted to change this to, ‘Oh, the cat is very fat.’), I watched my daughter spell out each word with her scrabble tiles. 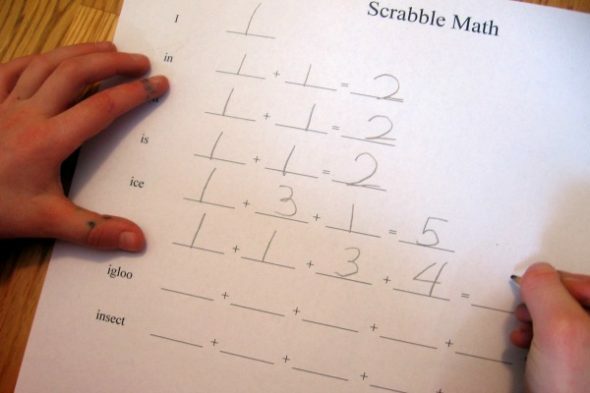 After spelling each word, she copied the value of each letter into the lines on the worksheet. As it turned out, adding these groups of numbers was very easy for her. I learned that the next time we play this I will pick some words with bigger point values! Since she whizzed through the worksheet, I told her to pick a really big word that began with “I,” and we would see how big a number its tiles would add up to. She looked at the wall behind her and said, “Insulation!” I helped her spell it. The joke was on me — all the letters of insulation are just one point each! For many more creative ideas for teaching math, follow me on Pinterest! 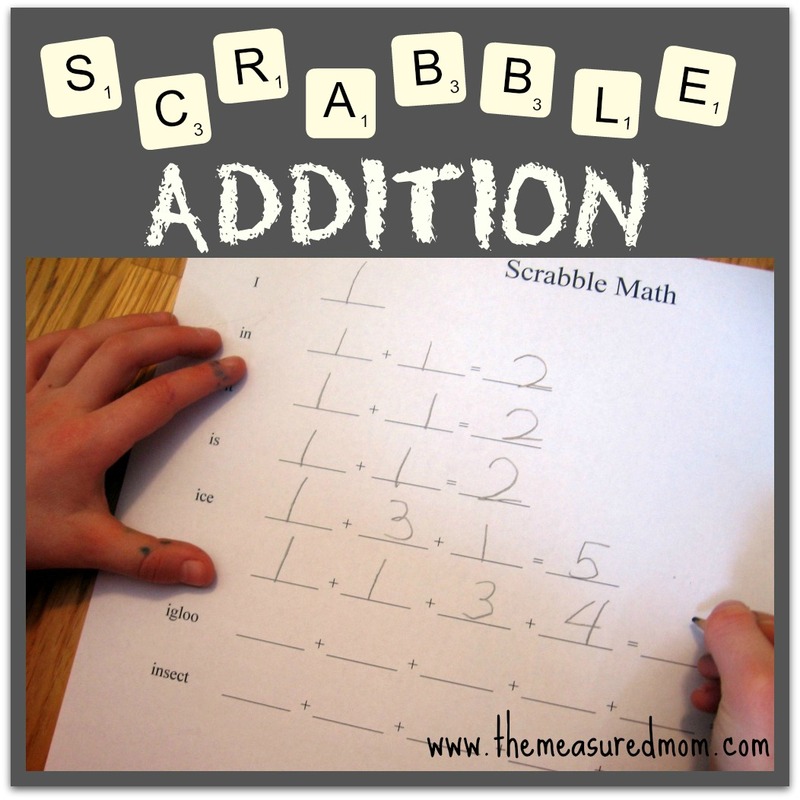 Follow The Measured Mom’s board Teaching Math on Pinterest. Cute idea! Might have to pick up a Scrabble game in the near future! I’m sure there are a million more ways to use those tiles – so it would be a purchase well made :)! Thanks so much for sharing those links, Patricia! Thanks, Heather! 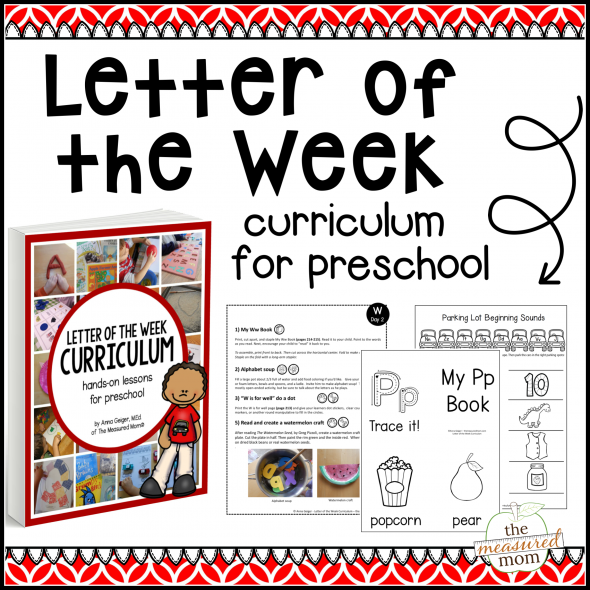 See you at the blog hop next week! This is wonderful! I love the combination of spelling & math! thanks for linking to Share It Saturday this week. Thanks, Karyn. I hope you can use it! Cute idea! I wish I owned Scrabble. This could be a great idea with my Kindergartner. What a great idea!!! I love this! Featuring this as well! This would be a great multi-number multiplication activity as well! Great idea, Ashley – I’ll have to file that away for when my kids are bigger! Thanks so much for the pin, Kelly!